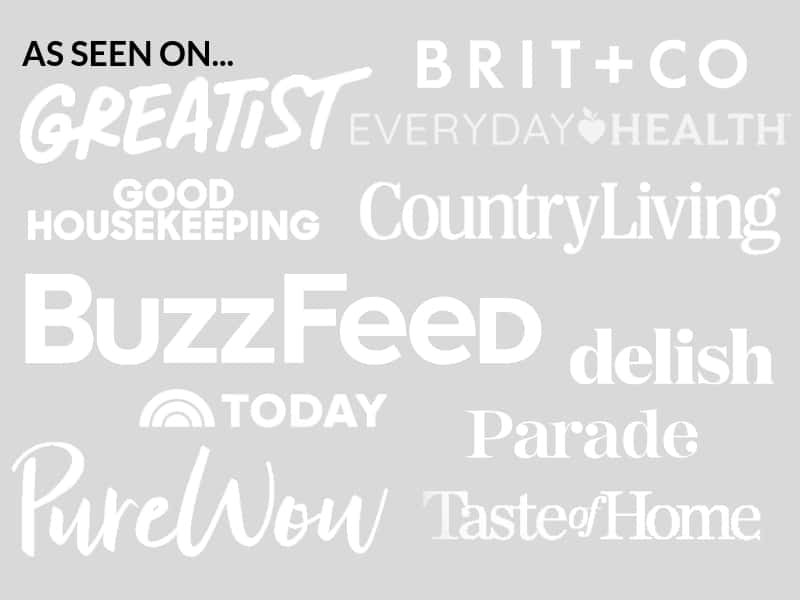 November 13, 2018 By Elizabeth Lindemann Leave a Comment / This post may contain affiliate links. Homemade Turkey Gravy made from the drippings of roast turkey is an absolute MUST at my Thanksgiving table. It’s easy to whip up a batch of classic turkey gravy in only 15 minutes, and it tastes SO much better than store-bought! I like to think of all the parts of the Thanksgiving meal as vehicles with which to eat gravy. I smother my turkey, mashed potatoes, and stuffing with it. And of course, I make a “gravy lake” in my mashed potatoes by creating a hole in the center and filling it with gravy. It wouldn’t be Thanksgiving without it! You really only need two ingredients for turkey gravy: flour and turkey drippings. And some salt and pepper, for seasoning. I always find that I have at least two-three cups of drippings at the bottom of my roasting pan after cooking the turkey. This recipe is for 2 cups of gravy, but let’s be serious: you’re going to need more than that. So you may have to supplement with some butter and homemade turkey stock in order to double triple quadruple this recipe. 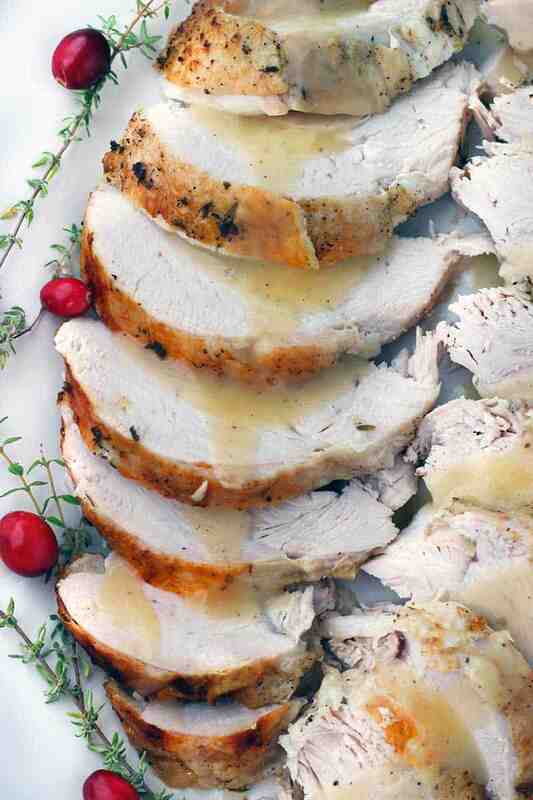 If you plan on roasting a turkey for Thanksgiving, you absolutely need to make gravy from the drippings. If you throw those gorgeous drippings away and opt for store-bought instead, you and I are NOT friends anymore. There is so much flavor in the liquid at the bottom of the roasting pan, and it makes the perfect base for turkey gravy. First, you’ll need to separate the liquids from the solids. I usually just pour the drippings through a mesh sieve. If you want the drippings to be EXTRA clean, you can add a layer of cheesecloth to the mesh sieve to really catch everything. 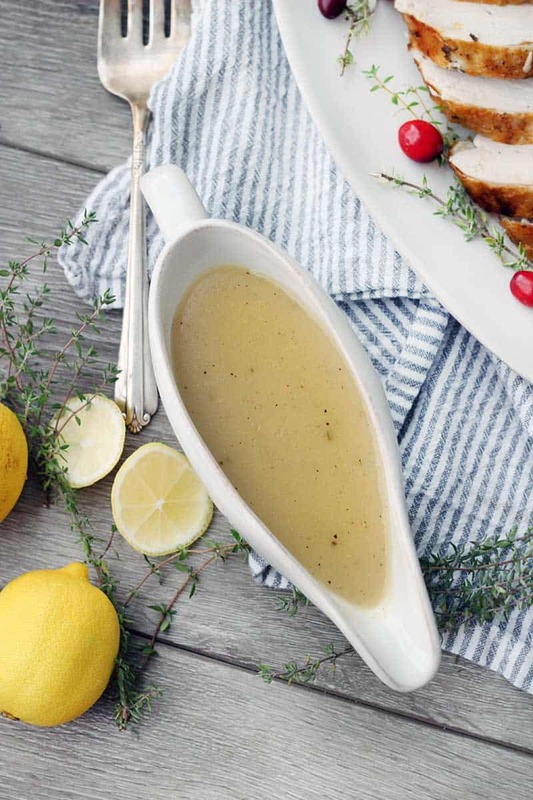 I pour the drippings into a fat separator– a super helpful tool for making homemade gravy. It allows you to pour the drippings that aren’t fat from the bottom of the container, after the fat floats to the top. After pouring the drippings, I usually wait for about 10 minutes for them to cool off a bit and for the fat to really separate and float to the top. Then, it’s easy to skim off the fat for the base of the gravy using a spoon. To make the gravy, you’ll first heat up the turkey fat in a large skillet. If you don’t have enough, you can supplement with butter. Then, you’ll add some flour. Whisk the fat and flour mixture continuously and continue to heat over medium-high heat for 2-4 minutes to make a roux. The texture will become similar to wet sand, and the color should change to more of a tan. You can continue cooking for longer if you like- the color will become darker and the flavor richer. However, the thickening power of roux decreases the darker the color becomes, so you may need to adjust your ratios. Speaking of ratios, it’s really easy to increase or decrease the amount of gravy you are making. In general, the ratio for gravy is for every 1 cup of liquid, use 2 tablespoons flour and 2 tablespoons fat. After your roux is done, just pour in the rest of the drippings (supplementing with homemade turkey stock if needed) and bring to a boil, whisking, then simmer on low until it’s thickened. Season with salt and pepper, and you’re done! I make turkey stock while my turkey is roasting. It’s super easy to do, and again, is much tastier than store-bought stock (although you can certainly use store-bought chicken or turkey stock for this). 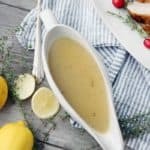 If you are planning on making more than 2 cups of gravy, you’ll almost certainly need to supplement with stock, since there won’t be enough liquid from the drippings. Before cooking the turkey, you’ll remove the neck and giblets from the package. Just place them in a medium pot (minus the liver- it’s too strong in flavor) along with a couple of carrots and celery ribs cut into pieces, and an onion, quartered. No need to peel anything! Season with just a little salt and throw some peppercorns in there, too. Then, bring to a boil, cover, and simmer on low for two hours, or for as long as your turkey roasts. Strain through a mesh sieve and you’ll have delicious homemade turkey stock to add to your homemade gravy (or to use in soups or stews later). One final thing- it’s possible to make turkey gravy from cornstarch instead of flour. This will provide a gluten-free option. Here’s a great recipe that will show you how to do it! For a vegetarian gravy option, try this mushroom gravy. And if you for some obscure reason happen to have any leftover gravy, it can be frozen up to 6 months in an airtight container. 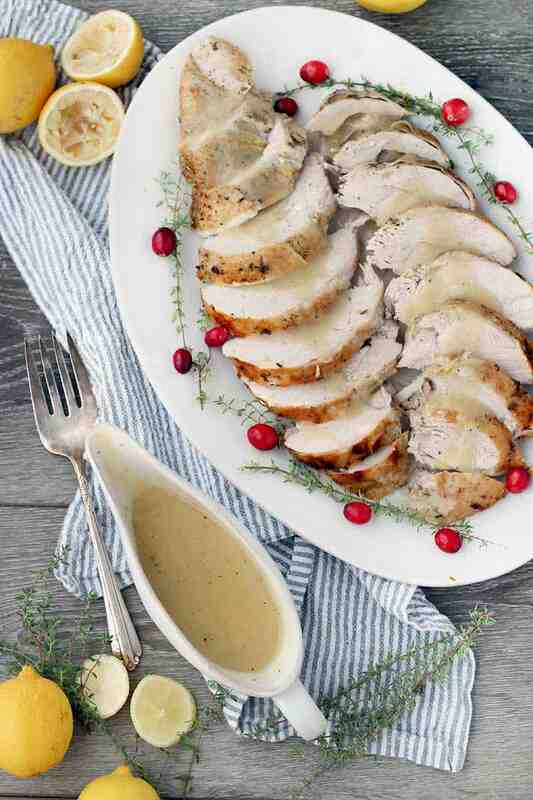 Here’s the recipe for how to make classic turkey gravy from drippings! 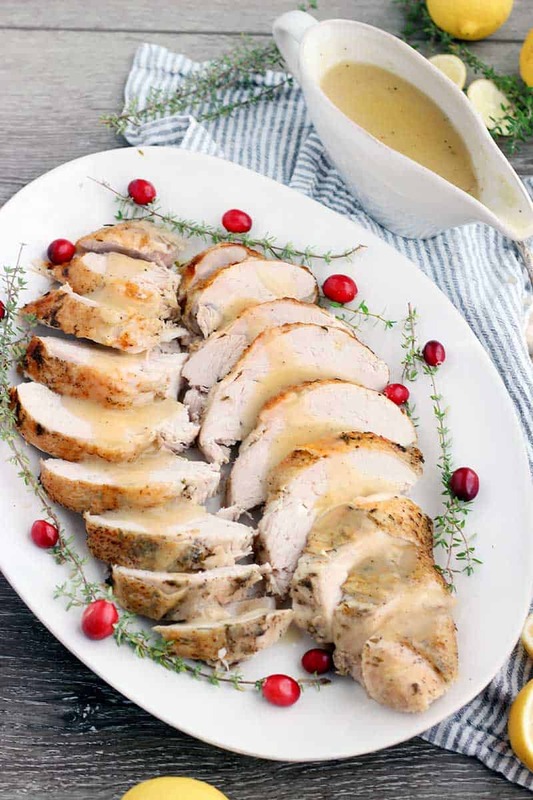 Making classic turkey gravy from scratch from the drippings at the bottom of the roasting pan is so easy and SO much better than store-bought gravy! Whip up a batch in only 15 minutes with this easy recipe. Pour the drippings in a fat separator (or glass measuring cup) over a mesh sieve to remove any solids. Wait for about 10 minutes for the drippings to cool and the fat to separate from the rest of the drippings and float to the top. Measure out 1/4 cup of the fat from the top, using a spoon to skim it off, supplementing with butter if needed. Measure out 2 cups of the liquid from the bottom of the drippings, supplementing with chicken or turkey stock if needed. Heat the fat in a large skillet over medium-high heat. Sprinkle the flour on top and use a whisk to stir together. Continue whisking constantly so it doesn't burn, allowing the flour/fat mixture (roux) to thicken. Cook for 2-4 minutes, until the texture resembles wet sand and it darkens in color just a little bit. Slowly pour in the two cups of drippings/stock, whisking constantly so there are no lumps. Continue whisking, bringing it to a boil, then turn heat to low and simmer, stirring/whisking occasionally, until thickened (about 5 minutes). You can double, triple, or quadruple this recipe depending on how much gravy you need. 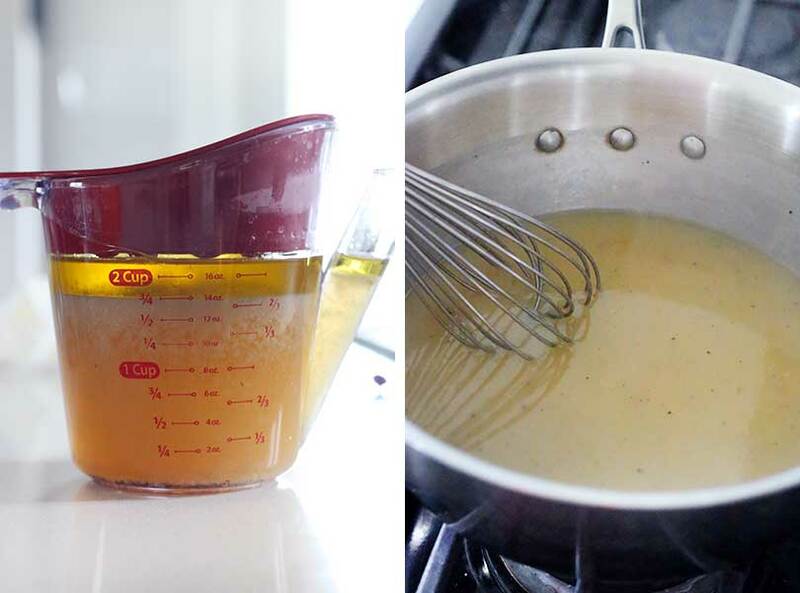 The basic ratio is the following: for every 1 cup of drippings/stock, use 2 tablespoons of fat and 2 tablespoons of flour. I like to make turkey stock while my turkey roasts from the giblets that come with it. Place the neck and giblets (minus the liver) in a medium pot with two ribs of celery and two carrots, cut into 2-3 inch pieces, and one onion, quartered (no need to peel any of these). Season with just a little salt and some peppercorns, and cover with water (about 8 cups). Bring to a boil, cover, and simmer on low for 2 hours, or for as along as your turkey roasts. Remove solids by pouring the liquid through a mesh sieve. Use the turkey stock to supplement the drippings for your gravy, or save it to make turkey noodle soup with the leftovers. For a darker colored gravy without adding artificial color, cook the roux for longer. The longer you cook it, the darker it will be. Keep in mind though- the thickening power of the roux will lessen the longer you cook it, so you may need to increase your ratio of fat/flour to liquid. I like my gravy smooth, but some people like to add the giblets to it. You can add the giblets (minus the liver- the flavor is too strong), along with the cooked meat from the turkey neck, after simmering them to make stock. Just chop them up into small pieces and stir into the finished gravy.